Isn’t she sweet and soft and puffy and dear and so, so adorable? 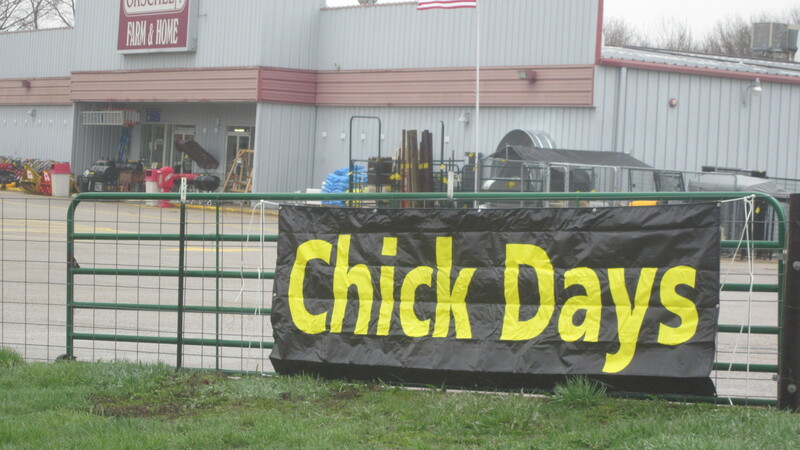 Every spring we wait anxiously for the sign to appear at our local farm store: it’s “Chick Days” at last, the true harbinger of spring here in Nebraska, at least for us country types. This spring has been unusually cool (not to mention snowy–not complaining, it’s moisture!) so we haven’t purchased our chicks until this week. It was a tough and very long two or three weeks for little Mack. Daily he asked me the question many, many times: “Can we go get chicks today–please?” It was a tough and very long two or three weeks for little Mack’s mama, too. 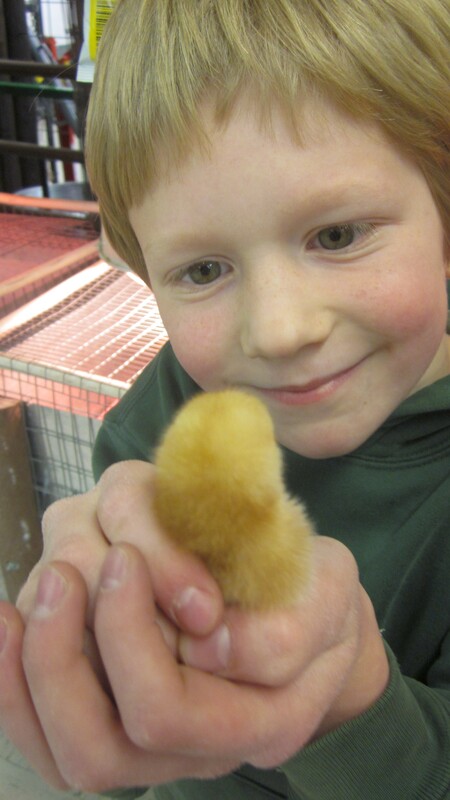 Here’s a sign that we wait for anxiously every spring: it’s Chick Days at the farm store! I could have just ordered them from one of the excellent hatcheries in our area, but usually I take the easy way out, and just watch what they get in at the farm store. The guys at the store get to know us pretty well. Randy is the poultry guy, and I’ve become pretty attached to the fella. He will tell me when the Americaunas (they lay the blue-green eggs, and I add a few pullets to my flock every year) are due to arrive, and he’ll even give me a quantity discount if I ask for one. You know that I will ask for one. And he always, always encourages me to buy more. “Don’tcha need a bigger box than that?” he’ll say, eyes twinkling, or “You’ve got room in there for a few ducks, I think!” He’s little Mack’s best friend at this time of year too, I think. I gave little Mack permission to choose one bantam for his very own, so he is very happy about that and bonds immediately with this little fella. Most years I like to go for the unusual heirloom breeds with the lovely names: Silver-laced Wyandotte, Black Australorpe or Speckled Sussex, but this year I decided on two tried-and-true excellent layers of big brown eggs: Rhode Island Reds and Barred Rocks. They look good together, and I’m in the mood for practical hens. And Randy gives me a discount because I’m so nice. (Or is it because he wants to get rid of these chicks?) Later I’ll add a few Americaunas when they get some in, and perhaps a few others. And that’ll be it. Maybe. These will be my laying hens for the next couple of years. Once they grow up, that is. We’ll have to baby them a bit, though, first. 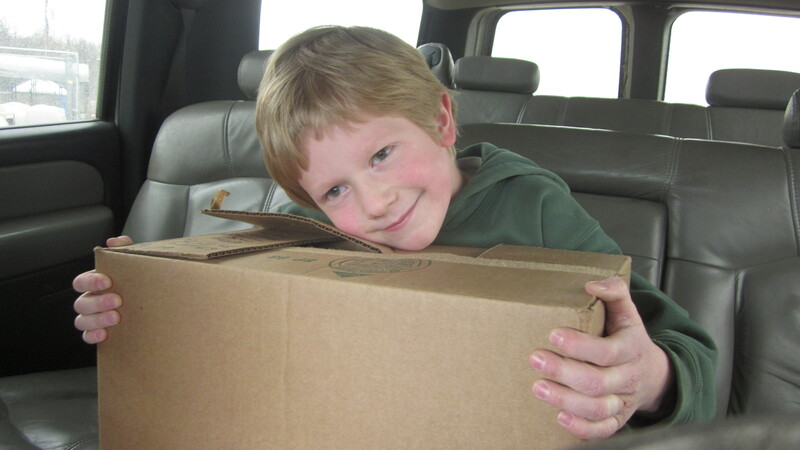 Little Mack is all smiles and he holds the boxful of chicks on the way home. They are so tiny that the 25 of them have plenty of room in this box. They’ll need a heat lamp and a draft-free place and plenty of food and fresh water and lots of gentle handling, so they’ll be pleasant and tame. It won’t be a problem–the handling, that is. Little Mack loves these chicks already and he is spending quite a bit of time at the chick box. It was easy to make this chick waterer and it took us 5 minutes to do it: ta-da! Saved about $8.00 and a trip to the feed store. He was so excited about getting chicks today that he took care of all the preparations at home before we left: to my surprise, he wrestled the mammoth box that we saved down the stairs to the basement (it’s too cold out in the coop for the babies yet) and he found a chick feeder, a heat lamp, and he looked mighty hard for a chick waterer. 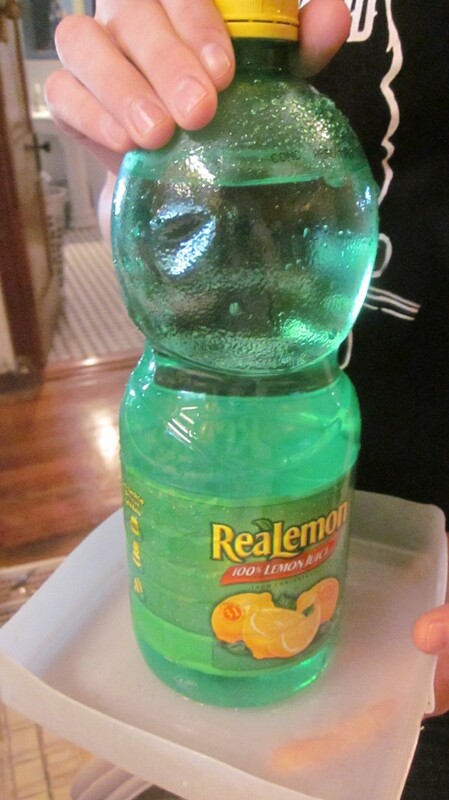 He couldn’t find one that wasn’t cracked (drat) so we made one of our own, out of stuff from the recycling bin. At home, we carefully transfer the babies into their new home, and then we have the fun of holding and playing with them for awhile. Not too long: they need to be under a heat lamp at approximately 95 degrees to be comfortable. Here’s the bantam that little Mack chose for his own. He has named him “Puffy.” I think I might have named him “Wee” because he is so tiny and sweet, and is tame already. See his little egg tooth at the end of his beak? That’s what he used to peck out of his shell. We’ll keep these little ones in the big box under the heat lamp for a week or two, or until the weather outside is a little warmer. Then they’ll go out into the “nursery” room of the chicken coop. They look so tiny in the big box, but they’ll grow very fast! The more we handle them, the more friendly and tame they will become, so I’ll encourage the kiddos to spend a bit of time each day playing with these cute little babies. It hasn’t been difficult so far to do this. Sweet. Life’s good during Chick Days. 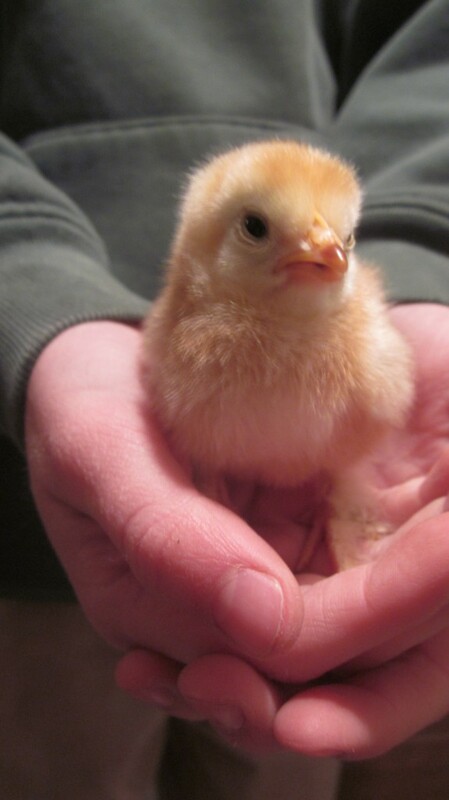 This little chick is going to get lots of loving. ← The ultimate comfort food, only better: coconut tapioca pudding! Wow, that was full of memories. 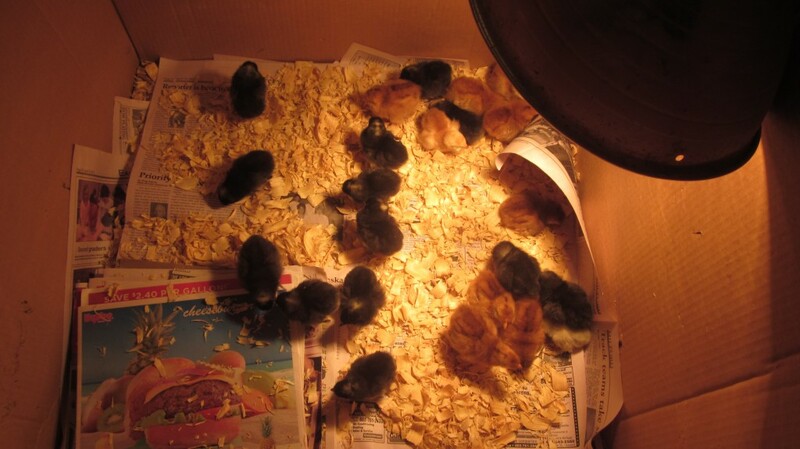 I have not thought about baby chicks and heat lamps for ages. I forgot the care that goes into getting them started in life. It’s easy to remember the work that is involved after they are out on their own, but the fun stuff, had completely slipped my mind. Thanks for cleaning some cobwebs for me. my pleasure, Chef! Thanks for taking the time to stop by! The chicks are absolutely GORGEOUS! Just adorable! I hope they settled successfully into their new home! So far, so good, Sophie! Thanks for stopping by! I’m really hoping so! Blessings to you! Oh what gorgeous pictures! I’ve never lived in a place with enough room for chicks – they are SO adorable and your photos are awesome. Thanks Isobel! It’s hard to go wrong photographing chicks. They’re so cute! This use to be our family. The kids would pick out the chicks and have great fun with them for a few weeks. Then it became a chore. I remember one year our daughter grew fond of a couple of roosters. They were butchered and she wouldn’t eat any chicken for awhile because she didn’t want to eat her friends. Lessons learned on the farm. Yes–that very scenario has happened at our place, Shawn. I remember one time we were concerned about our little girl Amalia’s reaction to the fact that we butchered one of her favorite roosters, Billy. I had a stock pot full of roosters on the stovetop, simmering, making stock. She walked through the kitchen and glanced up at them. “Oh, poor Billy,” she said, and that was that. 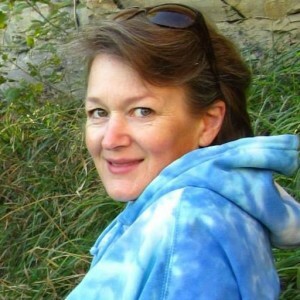 She was a farm girl and could accept that we usually made stew out of the roosters! How lovely. We used to raise golden speckled wine dots too. But all chickens are cute. I miss those days of worrying over newly hatched chicks. I used to pray to keep them safe overnight, then rush out first thing in the morning to check them. The ptotos are great. I must confess that I’ve lost a lot of hours of sleep worrying about baby chicks, too. They just are so vulnerable to so many ills! That’s why I try to keep them in my basement for a week or two before taking them out to the chicken coop, so I can check on them often. Thanks Francene for your comment. 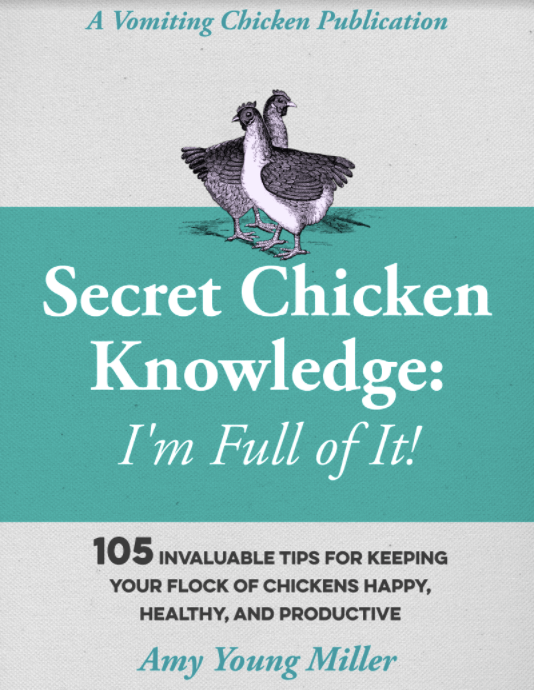 I haven’t worked on my “chicken memoir” in several days; will have to do a little writing tonight. How I remember those days of sweet chicks and I didn’t have any children to share the joy with. Our favorites were the Black Austrolorps, Barred Rocks and Rhode Island Reds for the perfect blend of eggs and meat. And, the White Brahmas, who were excellent brood hens and mothers, in addition to being ornamental. I’ve never raised Brahmas, but I’d try some if our feed store got some in. We do have some Polish Crested, and they give my flock some real character! You’re a good story teller Amy. When I lived on a ranch back in the day, I raised rabbits and we had chickens, turkeys, geese and ducks. I loved the little goslings – they followed at my heals whenever I was around. We had a 15 acre lake with an island and I had to row out there every day and collect the eggs that were scattered about there. Duck eggs are tasty. Eating my favorite rabbit was difficult, but when you depend on the food you raise to sustain you, you learn to live with it. Now my neighbor raises chickens and we either buy eggs from her or trade things from our garden that she doesn’t grow. I’ve raised animals of one kind or another most of my life and now I’m done, it’s plants for me from now on. Good for you, Julia. I’m so envious of the pond with an island in the middle. We used to keep ducks, but we just have a tiny run-off pond and no island and our ducks always get eaten by predators, one by one. You’ve done a lot and I’m impressed! 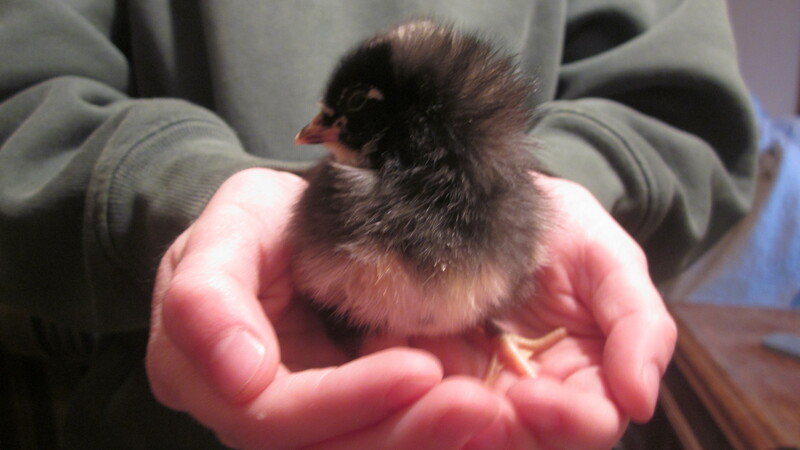 Reading this blog post made me sad; I wanted to snuggle a baby chick too! They are soooooo cute. Great post. I don’t know where you live but you’re always welcome to pop in to snuggle a chick at my house! Blessings! oh WOW they are soo cute!! Oh, Bek, I’d love to know which varieties you raised. Australorps, perhaps? Oh Cher, how exciting! What kind of duck? Can you get pictures? And a video would be sweet, too. Nothing cuter than a mama duck leading her babies around. I’ll be waiting to see those pictures!! 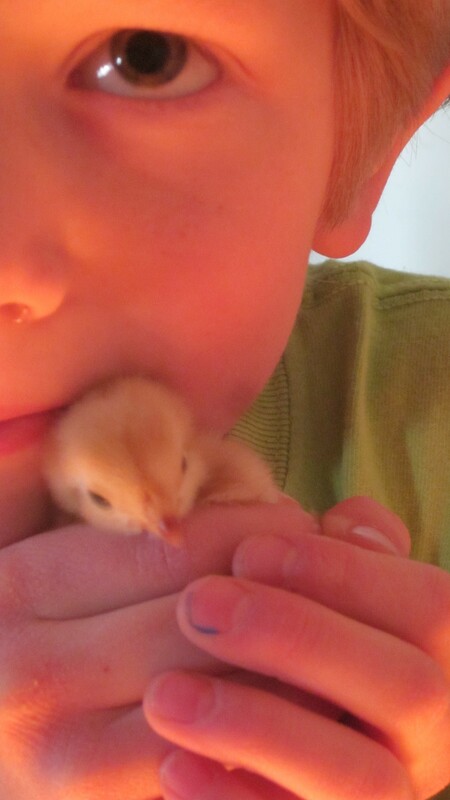 We enjoy getting chicks too… Fun part of spring.